Donald Trump uses his Twitter account for many things. He tweets lies about his imaginary accomplishments. He hurls viciously dishonest insults at his adversaries. He tweets fake poll numbers. And he sometimes retweets those who blow smoke up his backside. But now we can add a new category to the list, and let’s just say that it didn’t go well for him. On Tuesday evening, Donald Trump retweeted a video of two big game cats frolicking in the grass. 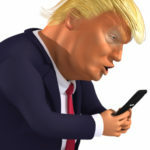 We watched the eight second long video intently, waiting for it to have some kind of political message, because Trump only ever tweets and retweets things that fit his divisive political agenda. But no, this really was just a cuddly animal video. Wait, what? We can’t stress enough that Trump never does this kind of thing. Nor is he usually on Twitter this late at night. The only clue here is that, right afterward, his Twitter account retweeted two tweets that had been posted by the official White House Twitter account. We don’t think Trump handles these kinds of retweets himself. So we’re inclined to conclude that one of his social media handlers jumped on Trump’s account to do the White House retweets, and accidentally retweeted the cutesy animal video along with it. Oops.